Pythagoras of Samos (Greek: Πυθαγόρας ὁ Σάμιος Pythagóras ho Sámios "Pythagoras the Samian", or simply Πυθαγόρας; Πυθαγόρης in Ionian Greek; c. 570 – c. 495 BC) was an Ionian Greek philosopher, mathematician, and the putative founder of the movement called Pythagoreanism. Most of the information about Pythagoras was written down centuries after he lived, so very little reliable information is known about him. He was born on the island of Samos, and travelled, visiting Egypt and Greece, and maybe India. 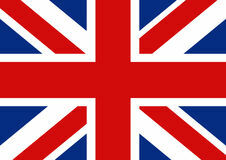 Around 530 BC, he moved to Croton, in Magna Graecia, and there established some kind of school or guild. In 520 BC, he returned to Samos. Pythagoras is someone most people have heard of, but he is an enigma. The trouble is trust. Can we trust what we read about him? Sadly, the answer is no. We can’t trust a lot of it, because if we did, we would have to believe he had god-like powers. We DO know about the beliefs of a religious-mathematical cult called the Pythagoreans. And we DO know that the Pythagoreans made great advances in mathematics. When the cult started, it was very secretive. After Pythagoras died, the secrets began to be revealed. Pythagoreans believed that everything could be reduced to numbers: the whole universe had been built using mathematics. The truth behind the everyday reality we experience lay in numbers. 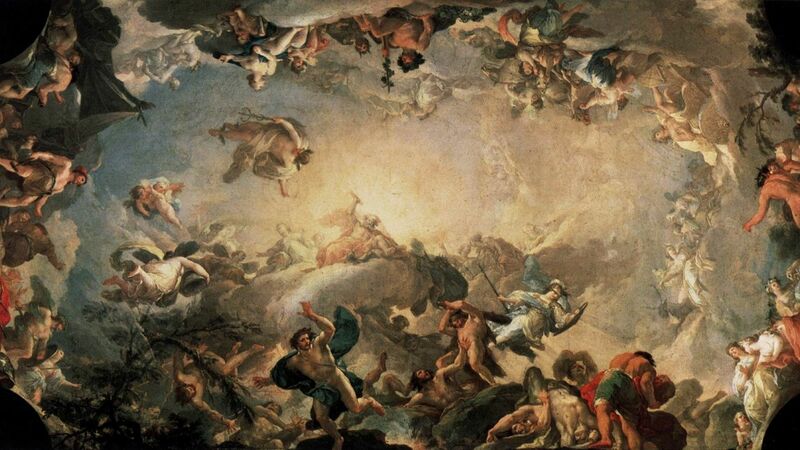 Modern physicists seeking the ‘theory of everything’ or the ‘grand unification’ are Pythagoreans. They believe that the universe can be completely understood through mathematical equations, and they are engaged in a quest to find these equations. It is sinful to eat beans. Men are represented by odd numbers and women by even numbers. Humans have souls separate from their bodies. These souls are reborn in new human or animal bodies after death. Pythagoras had supernatural gifts such as the ability to talk to animals, to remember previous lives he had lived as other people, to predict earthquakes, to stop the wind blowing and hail from falling, and to calm the sea’s waves. “The Master said so.” The Master, of course, was Pythagoras. So, what are the facts behind Pythagoras? 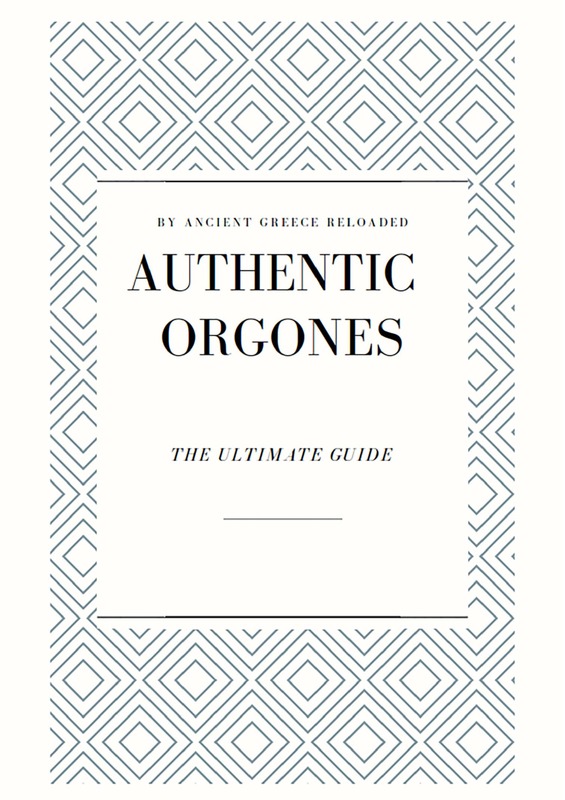 The Pythagoreans were a secretive bunch. Everything we know about Pythagoras was written many years after he lived. If we are to believe what is written, Pythagoras was like Dr. Doolittle and could talk to the animals. He once talked to an ox and persuaded it never to eat beans again! We do not know what Pythagoras really looked like. Facts about Pythagoras are difficult to state with certainty. There are no written records from his time. Most of what we know of him was written hundreds of years after he lived. It may not be reliable. Pythagoras was born in about 570 BC on the Greek island of Samos. His father was a merchant. Pythagoras was taught mathematics by Thales, who brought mathematics to the Greeks from Ancient Egypt, and by Anaximander, who was an earlier student of Thales. Thales advised Pythagoras to visit Egypt, which he did when he was about 22 years old. Pythagoras must have liked Egypt. He lived there for about the next 22 years of his life, mastering mathematical ideas AND spiritual ideas. To learn more about Pythagoras Wife click here: "Theano"
Pythagoras enjoyed life in Egypt. Pythagoras didn’t leave Egypt willingly. He was caught up in a Persian invasion and taken as a prisoner to Babylon. The Babylonians were probably the finest mathematicians in the world at that time. In Babylon, where he lived for about 12 years, Pythagoras learned mathematics and Eastern spiritual ideas, possibly from as far away as India. 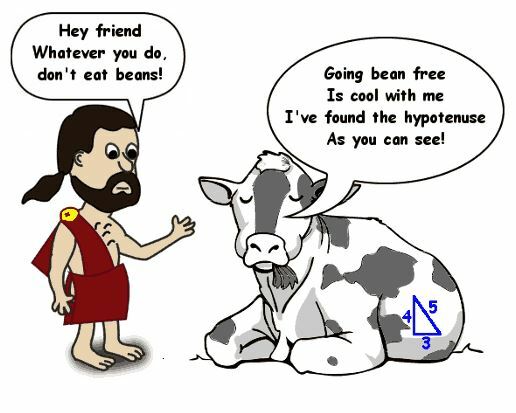 Aged 56 or so, Pythagoras was finally set free. He returned to Samos, his birthplace. There he began teaching people his philosophy of life, which was based on a mixture of his own ideas, mathematics, and mysticism from Ancient Egypt and the East. After two years, Pythagoras left Samos. Too many people there were hostile to his new ideas. He moved to the city of Croton, then part of Ancient Greece, now in Southern Italy. There his ideas fell on more fertile soil and he established the Pythagoreans. The Pythagoreans were a religious sect or cult whose beliefs were based on the power of numbers; honesty; living a simple, unselfish life; and generally trying to show kindness to people and animals. 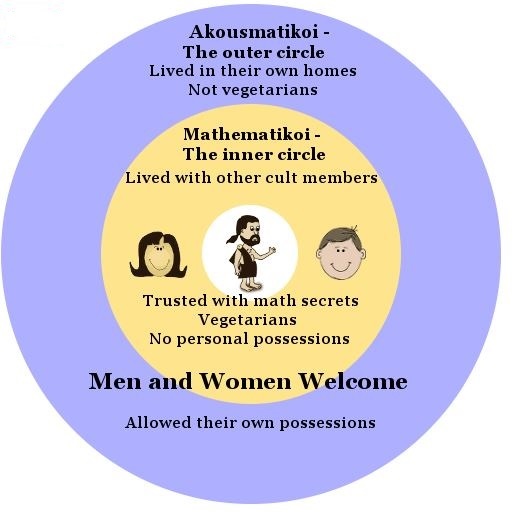 The Pythagorean inner circle was made up of trusted members who were known as Mathematikoi. There was a larger outer circle of members who did not have to follow Pythagoras’s orders as strictly as the inner circle. These members were known as Akousmatikoi. Men and women were welcome as Akousmatikoi and Mathematikoi. To Pythagoreans 10 was the supreme number. 10 can be made by adding the first four numbers, 1,2,3 and 4. These numbers form a perfect, equilateral triangle, the tetractys. Ratios of numbers from the tetractys are important in musical scales, which the Pythagoreans also thought had mystical powers. Pythagoreans prayed to the tetractys and swore oaths of faith to it. 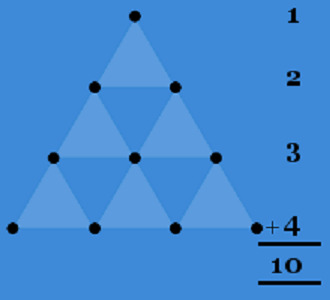 The Tetractys – a perfect Pythagorean symbol, both mathematical and mystical. What were the mathematical achievements of the Pythagoreans? The Pythagoreans made big contributions to Ancient Greek mathematics. We don’t know for sure whether these contributions came from Pythagoras himself, or from other Pythagoreans. Some of the mathematics came from Egypt and Babylon, so probably came directly from Pythagoras. The Pythagoreans and Greeks added something incredibly important to mathematics that other cultures had not. 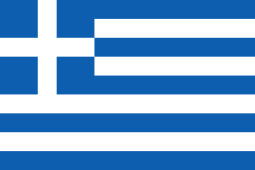 The Greeks made mathematics rigorous – everything had to be proved logically. They also carried out pure mathematics – math that had no practical purpose. They were the first ancient mathematicians to have the same priorities as modern mathematicians. The Pythagoreans believed that the basis of everything in the universe is numbers. Modern mathematicians and physical scientists have a similar belief. The Pythagoreans were the first people to realize that numbers exist in their own right. For example, 3 exists. You don’t need 3 people or 3 chickens or 3 lines to justify the existence of 3. All numbers have their own existence and don’t need to be associated with real objects to become real. For a right angled triangle the sum of the squares on the other two shorter sides equals the hypotenuse squared. Pythagoras learned this rule from the Egyptians and Babylonians. It bears his name because Pythagoras was probably the person who proved it was true for all right angled triangles. 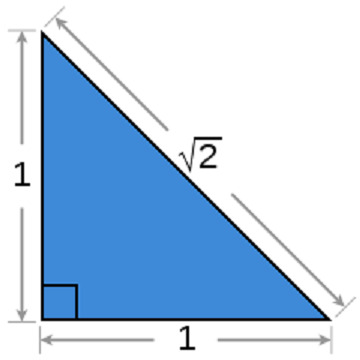 Pythagoras’s theorem produces irrational numbers. When you use Pythagoras’s theorem on a triangle whose two shorter sides each have length of 1, you discover that the length of the hypotenuse is √2. You can then prove mathematically that there is no ratio of whole numbers which can produce √2. This is unlike the case of, for example ½, which is the ratio of the whole numbers 1 and 2, or ¾, which is the ratio of the whole numbers 3 and 4. If you try to write √2 as a decimal fraction, the digits after the decimal point go on for ever with no repeating pattern. The mathematical proof that √2 is irrational was found by a Pythagorean. It may have been found by Hippassus. Some legends say that Hippassus was drowned for his proof, or for letting people know about it; however, there is little evidence for this. The discovery of √2 and other irrational numbers was a shock for the Pythagoreans. One of their core beliefs was that everything in the universe was built using whole numbers and their ratios. They had to change their beliefs, but this was a painful process. Even today, the horror of the Pythagoreans in finding such numbers lingers in our use of the word irrational to mean crazy or illogically wrong. There are five highly symmetrical, regular 3D solids. Their symmetry allows them to be used as dice. Pythagoras himself established the existence of the first three solids – probably from his time in Egypt and Babylon. Other Pythagoreans probably discovered how to construct the other two. The solids are the tetrahedron (4 sides), cube (6 sides), octahedron (8 sides), dodecahedron (12 sides) and isosahedron (20 sides). These five shapes are called the Platonic Solids after Plato, who believed these shapes were the basis of the five Ancient Greek elements: Earth, Air, Fire, Water and Aether. 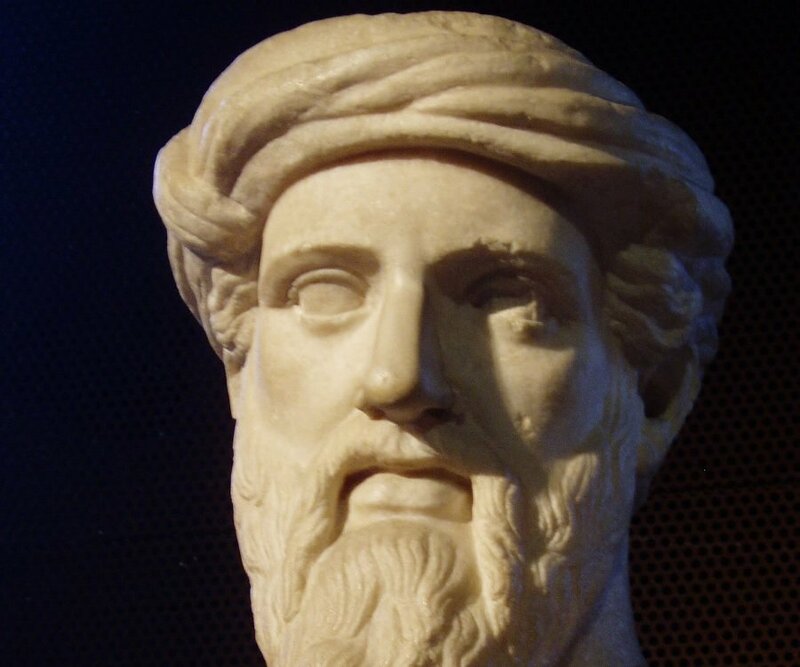 Pythagoras believed that, like everything else, music was based on whole number ratios. He also believed in its healing properties. There is a tale that he heard the different sounds made when blacksmiths’ hammers hit different sized anvils and realized there was a mathematical relationship. 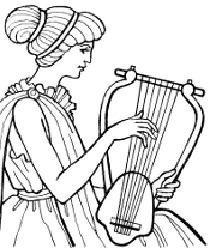 The Lyre was a popular instrument in Ancient Greece. Pythagoras was actually a skilled lyre player and probably studied the relationship between musical pitch and string length. He would have discovered that musical notes are indeed ruled by whole number ratios. Pythagoras’s own contributions are uncertain, but we know that two Pythagoreans, Philolaus and Archytis, worked in this field. Philolaus discovered that if you half the length of a string, the note produced increases in pitch by an octave, and that if you reduce a string by two-thirds, the pitch of the note moves up by one-fifth, and that an octave is not divided into two equal halves but into a fourth and a fifth. 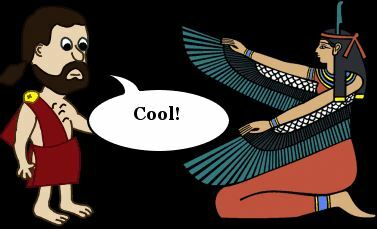 Archytis was the first person to prove musical relationships mathematically. Pythagoras appears to have believed Earth was at the center of the universe. Later Pythagoreans like Philolaus disagreed. They believed that Earth and everything else, including the sun, orbited something called the central fire. Nicolaus Copernicus cited Philolaus when he described his new view of the solar system almost two millennia later. Pythagoras is thought to have died at the age of about 75 years, in about 495 BC. Some ancient sources claim he lived to be 100. He may have died in Croton, or he may have died in the city of Metapontum, along the Southern Italian coast from Croton. Wherever and whenever he died, his mathematical legacy is still with us.